Bear Family Records, Germany, issued between 1992 and 1997 a total of four CD collections which included every song Miss Day recorded as a solo artist for Columbia Records. Each of the four boxed sets contains in chronological order each recorded track and the copyright dates of each recording. Each boxed sets houses individual CD’s and a hard bound book replete with photos of Miss Day, movie posters, and vinyl records. There is a narrative describing Miss Day’s motion picture and recording activities during the period covered in each boxed set. But most significant is the Discography section contained in each book. This section provides details on the recording studios, the dates of the recordings, the song tracks in question, the song composers and best of all the tracking numbers used by Columbia Records for each song track. The following does not enumerate the song tracks, but the statistics of each track broken down as a commercial release or a previously unknown track or different versions of known Doris Day songs. For the unreleased tracks, the title of the song is identified. This is an important statistic since it identifies previously unknown tracks. 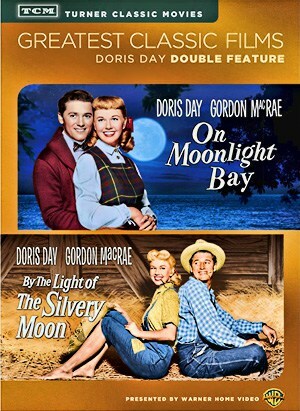 These boxed sets are a must have in any Doris Day records collection. It is almost impossible today to find each of these recordings in singles format. The LP albums are available, but at hefty prices when in mint or near mint condition. Note: There were other tracks recorded during this period but were not copyrighted until 1993 and are contained in CD6. Note: Again there were other tracks recorded during this period but were not copyrighted until 1993 and are contained in CD6. Note: There are other tracks recorded during this period which were not copyrighted until 1993 and are contained in CD6. Summary: The Bear Family Record – It’s Magic, Doris Day (1947-1950) contains 103 tracks released commercially in single or album format by Columbia Records, and 21 previously unreleased tracks. Summary: The Bear Family Record – Secret Love, Doris Day (1951-1955) contains 124 tracks released commercially in single and album formats by Columbia Records, and 12 previously unreleased tracks. Summary: The Bear Family Record – Que Sera, Doris Day (1951-1955) contains 117 tracks released commercially in single or album formats by Columbia Records, and 11 previously unreleased tracks. Summary: The Bear Family Record – Move Over Darling (1960-1967) contains 168 tracks released commercially in single and album formats by Columbia Records, and 20 previously unreleased tracks. 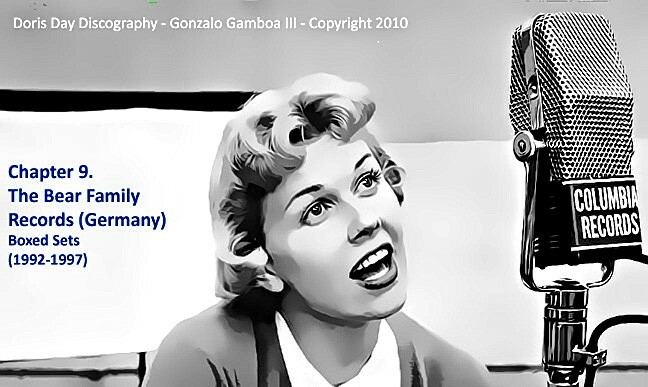 Grand Summary: The four Bear Family Records of Germany Boxed Sets contain 512 Doris Day tracks released commercially in single and album formats by Columbia Records, and 64 previously unreleased tracks, for a grand total of 576 Doris Day recorded songs.